What's the golden rule when making homemade deodorant? Yet the third effort was a go! On my first try, I combined equal amounts of baking soda and arrowroot powder (1/2 cup each). While the deodorant worked like a charm, the baking soda irritated some family members. It created red painful welts with repeated use and arm movement. Finally, I tried what you see below: 1/4 cup baking soda and 3/4 cup arrowroot powder (plus clay for absorbency and odor control). And now I'm fulfilling my promise to share our natural deodorant recipe — it really works. And no nasty chemicals like store-bought! Makes about 3 tubes of deodorant (depending on tube size). *Increase beeswax during the summer or if you live in a warmer climate. Melt coconut oil and beeswax together over low heat until just barely melted. Remove from heat. Add remaining ingredients except essential oils. Let cool, stirring every 5 minutes or so, until it hardens to a pudding consistency. Put in the fridge to speed this up, checking and stirring frequently. Add essential oils and mix well. Spoon into empty deodorant containers. Let harden overnight in a cool location. You can speed this up by putting in the fridge to harden. Don’t have an empty deodorant container? Use a pint or half pint jar. Use about 1/8 teaspoon for each arm. (Omit beeswax to make it easier to scoop.) Or, use muffin tins to create a “cake” of deodorant. Keep wrapped in tissue paper when not in use. Rub the cake under arms to apply. Summer weather. The deodorant is like soup in the summer, whether in a jar or in a tube. I tried doubling the beeswax and that does help if the temp is just warmer but not really hot. Here's what you can do in very hot weather. 2) Or, keep your deodorant in a jar and apply with fingers. You might notice a little separation of coconut oil settling on top; just stir that in with your fingers, then scoop some out and apply to the underarms. I actually prefer applying with my fingers rather than a stick — because I can rub it in well and I find better odor and moisture benefits. So just play with it and don't let summer weather prevent you from using and loving natural deodorant. Reusing deodorant containers. It's not the easiest thing to get chemical deodorant out of containers — that junk definitely repels moisture and doesn't want to come out! However, a basin of soapy water for soaking and an old toothbrush does a pretty good job. Once you've got clean containers you can reuse them again and again. And again. Adjusting. Coming off chemical deodorants, you might find natural doesn't work for you right away. Give your body time to adjust. A few weeks. Big batches. You can triple or quadruple this batch. Store what you don't use in a jar in a cool, dark cupboard. Remelt over a simmering water bath and refill tubes as needed. It's a big time saver! 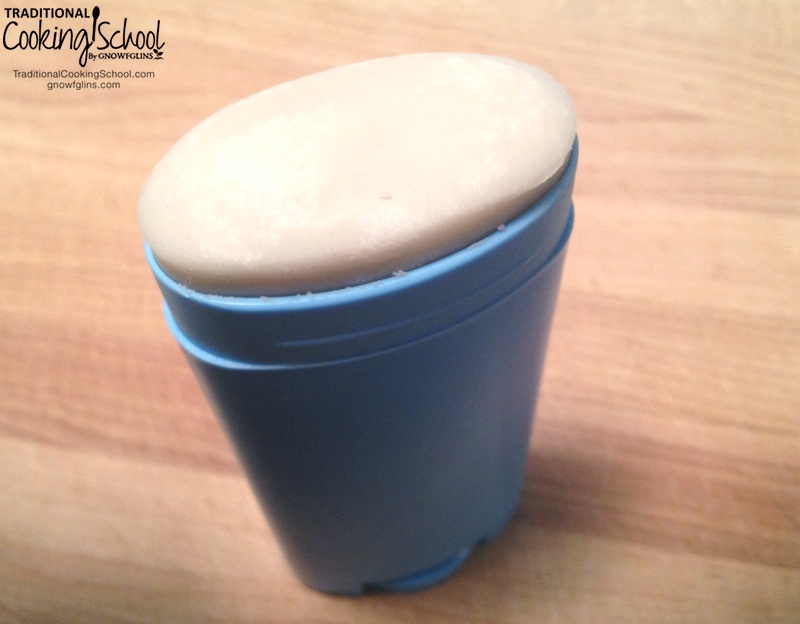 Do you use natural homemade deodorant? What's your favorite DIY deodorant recipe? Any tips? Please share! I prefer to use mine in a little pot or jar and apply with my fingers, as well. It even works on my hippy, unshaven pits! Yeah, even in summer! The irritation from the baking soda may have been because of shaving? My husband and I just pour baking soda from an old-diner-style sugar dispenser and rub it under our arms. When I used to shave it would leave redness and irritation. When I went “au naturel” the irritation stopped. I do find that, for me, morning and before bed applications work best, since I seldom shower two days in row. Hubby works outside the home and showers every day, so once right out of the shower works for him. Hi… just saw this natural deodorant on FB, came here to read your blog about it… Would you know, if this is an ANTperspirant? My son is in his teenage years and going through the armpit waterfalls! lol and I’d like to know, if you sell your homemade products? Nilda — The clay does function somewhat as anti-perspirant because it absorbs moisture. I’d give it a try and see how he does. It works really well for our teens, though it has to be applied more often than conventional. However, they were having trouble with conventional not working well and this works better so… we’re ahead of the game. That is a lot of essential oil to put in such a small amount of deodorant which might smell nice but could be very irritating to people on that part of the body. This type of deodorant is the best I have ever used, however, and it also works as an excellent antiperspirant. Thanks, Tom — and no one finds that irritating? The baking soda is a really issue for people in my house. i found the baking soda to really irritate me in another recipe after about 6 months of use. 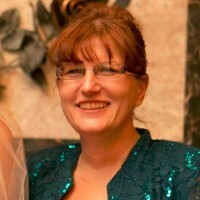 I am a health & wellness coach & have not used commercial antiperspirants or deodorants for many years. I have used only EO blends with great results (only the purest in the industry, those that are safe for internal use as well, any others can have additives & solvents added that can irritate skin). I have used 100’s of drops neat for spinal applications w/o any type of irritation. It all depends on the quality of the oils you use. Actually EOs can work as a deodorizer. I have read in a number of places that some EOs, such as Tea Tree Oil, are deodorizing. They have worked for me in a number of different personal and home applications. I have been making my own deo for almost a year now, and LOVE it! It works better for me then any store bought ever did, even the “prescription”stuff. I had read about using the bentonite clay and wanted to try. So I can’t wait to try your recipe, especially as I had the same issues with baking soda (careful with the citrus oils too). I like Elizabeth’s suggestion of using DE too. I use DE for all sorts of stuff already. Thanks for your recipe. We are going to try this, and other recipes this week at our place. I understand Tea Tree Oil to be a naturally antibacterial agent… which would be ideal in a deodorant, absolutely, since it’s actually bacteria that creates B.O. All my natural household germ killing sprays (for hard surfaces such as toys, counter tops) are actually thyme oil. I wonder if that would be an irritant on skin…. Also, I love your idea of reusing twist-up deodorant containers too! Body odor is caused by microorganisms feasting on us. There are many EOs that have antimicrobial properties, so that would help keep the pit stench down. Tea Tree oil is one of those. I believe Clove oil is too. Coconut oil also has antimicrobial properties. 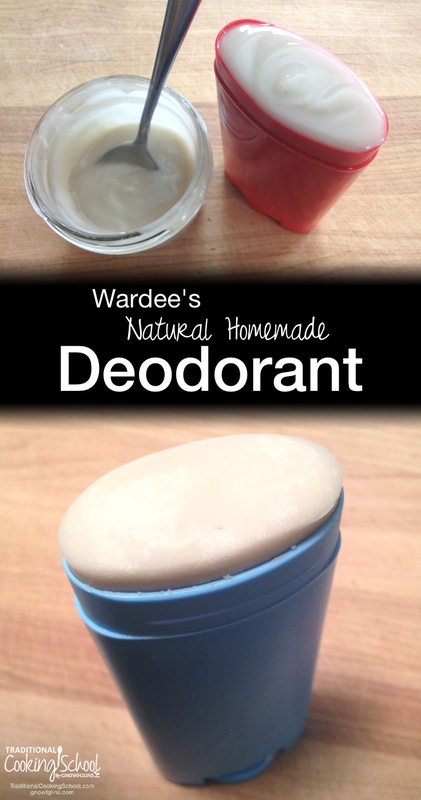 I have been looking at homemade deodorant and seriously thinking about trying it. I think I would like it but I’m concerned about my husband. He uses lots of deodorant normally, sometimes applying a few times a day. And he sweats a lot! Do you or your family members sweat a lot? Do you think this would work? Leigh — Did it lighten up when it cooled? Ours is a light grey. I think we do get residue when we put it on with the stick and don’t use fingers to really rub it in. I can’t say for sure on the white shirts because none of us wear white (we get too dirty), but we don’t have residue on other shirts even if they’re light colored. I hope this helps. Please do share your findings. I’m very interested! It didn’t lighten up… It’s still grey (I’ll post a pic on IG and tag you), but it doesn’t seem to be an issue so far! I am loving this!!! I am using my fingers as well, which I thought would be an issue for me but is no problem. I really do like that I can rub it in well that way. And as I’d already detoxed from antiperspirant several months ago, I don’t seem to be having any detox/adjustment issues either. This works so well – even on very hot days (yesterday) and very active days (today). I noticed less sweating and no stinking!!! I wore white shirts each day to see how it would do, and no problems with residue or staining at this point. Thank you so much for posting this! My deo has ruined several shirts. Its a bummer. I cant use baking soda either. I gave up on the homemade deo. I’m sorry to hear this, Helene! I *really* like it! The rose smells SO good and the citrus is great, too! I use food-grade diatomaceous earth instead of baking soda. It makes a brown paste/lotion instead of white, absorbs odors thoroughly, and makes THE MOST EFFECTIVE deodorant I have ever used. I have just begun experimenting with adding beeswax to make a bar instead of a lotion, but it came out a bit too hard last time. My last batch was roughly equal amounts of coconut oil, shea butter, DE and beeswax, with lavender oil for fragrance. I just use the powder and essential oils, no coconut oil, no beeswax, no clay. 1 part baking soda to two parts arrowroot powder. Have done for the last 10 years. Has anyone discovered whether or not this recipe stains and hardens shirts? Furthermore, does anyone know what it is in anti-perspirant or deodorant that hardens armpit in shirts and makes them grey and yellow? Is it aluminum? I’m a sweaty beast of a lady with four preschoolers in tow– haha. Haven’t been able to kick this lifelong problem, even when ai used Tom’s. Jill — Look above a little at Leigh’s question and my answer and then her follow-up sharing what happened when wearing a white shirt. I’m not sure what causes the staining from commercial products. Ok- read Leigh’s trial. It’s very similar to mine. Well, praise God. How cool. I’ll make it! Thanks for all your labors, W! This caught my eye, as I come from a long line of avid sweat-ers in my family. I was wondering: 1. What type of clay do you use? I clicked the link, but there are a few types of clay listed. Is it the powdered kind you’re referring to for this recipe? 2. Have you found this recipe to be any cheaper than an “all natural” deodorant bought in a store? I am so lazy lately. I have wanted to try making deo for a while but I have so many other issues to tend. In the meantime I use a few squirts of magnesium oil in each pit and it seems to do the job. My Hubby is a die hard salt fan. hey thanks so much for posting i’m really excited to try – but do you have any suggestions on where to find some of these ingredients? can’t even think of a place to look for beeswax! and arrowroot powder? thanks for any help on this! Meghan — You can follow the link up there to beeswax, and for arrowroot check the bulk spices of the health food section. Or through your health food store. It’s an alternative thickener to corn starch. I also found blocks of beeswax in the cosmetic/soap/personal care section in Whole Foods… I had to ask an employee to point me in the right direction, but there they were. I was so excited to make this! The natural deodorant I had been using was a similar blend of ingredients but had way to much baking soda and gave me a nasty rash. I got my beeswax and clay in the mail today so I was excited to try this recipe. I decided to make a third of the recipe just so I wouldn’t be wasting too much if my skin reacted poorly to the blend. My mix seemed to come out fairly well, I just have a few questions/concerns. First, the beeswax I ordered has a very smell odor to it, I figured it would have some but this odor gives me almost a nauseous feeling/ light headache. With the essential oils and other ingredients blended in its diluted but still reminiscent. Does yours have a strong scent? And then about the essential oils. I decided to use tea tree, lavender, and bergamot. However when I was dropping in the bergamot a bunch spilled in instead of dropping, maybe 10 drops at once. And then even trying my best to not make the same mistake, I poured way too much tea tree in as well. The scent isn’t strong at all and it barely smells like the oils since the beeswax is pretty overpowering, but I am wondering if it is ok for my skin? In one of my pits it was a little ‘tingly’ after I rubbed it in. Do you think that much essential oil will be a problem? Julia — I can’t help you on the beeswax, I’m sorry. Our beeswax is just lightly sweet smelling like honey. I wonder if you’ll get used to it? Regarding the EOs, I think you should just apply sparingly and see how you do — do you continue to get the tingling? What about a rash? If you feel the EOs are too strong, then you can make another 2/3 batch with everything BUT EOs and melt all together to dilute them. I do have some residue on my clothing. I did make mine in waxed paper in a plastic soap storage container (for shape) and I store it in the refrigerator. It’s hard and bumpy when I rub it on so maybe I’m not rubbing it in enough or I’m using too much. Any thoughts? Bergamot needs to be diluted greatly. It can cause skin damage if exposed to sun after application. Wardee, what’s the purpose of the beeswax? Wardee – ever go with an off the shelf brand? I use Lavilin, which I’m a big fan of. They are in Whole Foods now too, so it’s easily accessible. Joan, had been using Lavanila for about a year, I was happy to find a natural deo that actually worked (NOTHING else had before) and smelled great as a bonus. Negative – $18 for a tube that lasted 6 weeks. I still had to reapply towards the end of a “heavy” day. My history is smelly, but sensitive pits and I live in Florida. Four months ago – summer in FL – I started using a similar recipe (it’s a smaller batch) – 1/4 c. each baking soda and arrowroot with 6-8 Tbs. coconut oil – and an assortment of essential oils for different batches. IT WORKS! I can go all day and even wake up the next morning with NO bad smell!!! No irritation. Even at the beach and camping I was having (making) my friends smell my pits! MUCH cheaper than the Lavanila! Actually, I was referring to Lavilin not Lavanila. I’ve gotten them confused before too, lol. I’ve tried Lavanila and had a very similar experience as you. I feel like it’s overpriced and ineffective. Lavilin, on other hand, is AMAZING. It lasts a week for me, just as advertised. I usually apply to my underarms and Sunday evenings and do not need to re-apply for another 7 days. I’ve even gone up to 8-9 days before! Smells great and I highly recommend giving it a shot if you’re looking to experiment with a new brand. Hi, I have a question, I’m really interested in trying out this recipe..however I’m a little sensitive to EO..esp. tea tree oil..I’m not sure if I’ll be ok with it..makes me nervous. I really want this deodorant to work..what would you recommend for a sensitive person? Do you think I could substitute shea butter for the beeswax? Hi Erica. I totally think you could substitute. The beeswax is there to make the deodorant more solid. So if you’re ok with storing it in a jar and applying it with your fingers, you should be good. The shea butter will make is nice and moisturizing. I have been making my own deodorant for almost a year now and what works for me is coconut oil, arrowroot, Shea butter(which I absolutely LOVE!! ), lavender and tea tree essential oils. I had to omit the baking soda becaus of how it irrated my skin. I have found that I don’t need to use my natural deodorant as much in the winter and I even got through my first ‘hot-flash’ summer……I wasn’t sure id be able to but everything worked out! At times this winter I had just used Shea butter just by itself especially if my underarms were irritated and then I would forget to put my deodorant on and I then didn’t need to. I love my homemade deodorant so much that I feel like I have perfume on since I don’t usually wear perfume (makes me sneeze). Thank you Wardee for all the helpful information you provide, I’m learning So much! Hi there, thank you for the recipe. 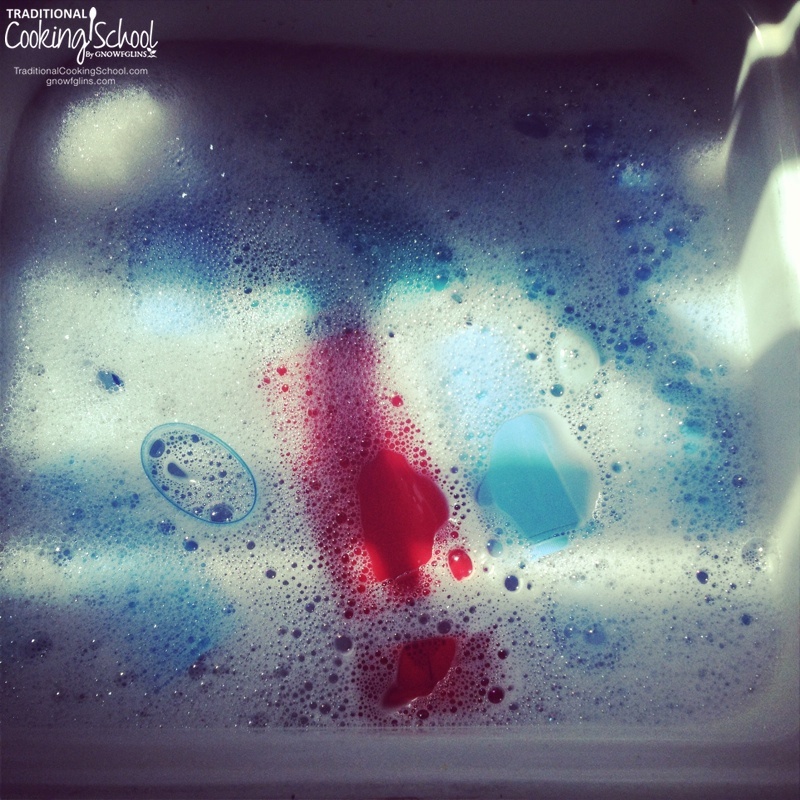 Can I use something other than the baking soda? My pits turn a deep red color, raised bumps and is VERY itchy. I really hate allergies, don’t you? Try zinc oxide. 100% safe as long as you get non-nano zinc oxide, which is not absorbed into the skin. I would think you could manage the marigold infusion by heating it with the coconut oil/beeswax mixture. Thank you so much for sharing your recipe. For a year I used a simple coconut oil, arrowroot & baking soda recipe with great success. Then all of a sudden I started experiencing skin irritation. I figured it was the baking soda. I made a batch of your recipe recently. I did cut the baking soda in half just to be on the safe side since I am so sensitive to it. Next time I make it I might use 3/4 of the recommended baking soda and see how I do. This is working well for myself, my husband and my 8 year old boys! I reused some old deodorant containers and also just put some in a jar. Either way it works fantastically! Now that the weather is warming up I am going to experiment with adding a bit more beeswax. I had my 14-year-old old son whip me up a small batch of your deodorant this week. So far, it is working great with no BO or irritation. I have tried several natural deodorants which didn’t work, and other recipes with baking soda left my pits raw and itchy. I will see how it goes when warmer weather arrives. Thank you so much for this recipe! I’ve tried deodorant recipes with baking soda and had a HUGE raw red rash develop where it was applied. In researching it a bit I understand that the baking soda is the culprit. Can you leave that ingredient out and still have it work? Barb – My experience was that it didn’t work quite as well without baking soda — but give it a try. It may work well enough for you! Barb – You could also try Diatomaceous Earth in place of baking soda. That was suggested on Facebook as less rashy. I might try this for my family. My husband’s skin is incredibly sensitive, and he reacts to all but one specific type of deodorant, a roll-on. He can’t even use the solid version of the same brand. Would it be possible to make this more liquid, and then use it in a roll-on deodorant container? Living in AZ I have found it very useful to cut the coconut oil in half, and make up the other half with shea butter or coco butter instead. It firms up very nicely and stays firm even in hot weather 🙂 I also add a few drops of Vitamin E to keep it fresh. Essential oils can melt plastic, but it is fine to use if the EO’s are diluted, as in this recipe. What other essential oils aside from lemongrass can be used? Does it serve a function in oil/oder control like the tea tree oil? Im playing around with a similar recipe. I want a deodorant stick that will not melt in the summer. I think this recipe has a little too much coconut oil. I tried using beeswax ans cocoa butter the first time but my recipe came out too sticky. Next time I will add a little oil (about a tablespoon) and definitely more cornstarch and baking soda. I only used a Tablespoon total in my recipe. I see you used much more. Lavendar essential oil is a great addition to this because it kills bacteria which causes odor. I apologize if I’m repeating a question, but I don’t particularly like the smell of melalueca. Do you think cutting the drops by adding lavender would still work? My family still shaves, so I was thinking the lavender might also help with the itching that comes with that… thoughts? Connie — We have found that this deodorant doesn’t work as well when eliminating the tea tree oil. But you could still try to find that magic amount — perhaps lessening it somewhat? I was wondering i currently don’t have corn starch or arrow root could i use potato starch instead? I use coconut oil, baking soda and cornstarch but I’ve heard cornstarch can be contaminated. Is this true? I use the Argo brand. Hi Melissa, try arrowroot starch…..you get away from the cornstarch and more than likely, bypass the GMO aspect that the corn is bringing. This formula also kept it softer during the cold mornings when I was in the north this summer! i use a pea size amt. often the problem is using too much. n i use a qtip to stir it up n then apply to my pit. 1 end for each pit, perfect! I’ve been using homemade deodorant for almost a year. I use the one with equal parts coconut oil, baking soda and arrowroot starch. At the end, I’ve been adding the “Joy” blend essential oil from Young Living. It’s worked extremely well for me, no irritations. Some days I forget to apply it and it seems that I can go for a few days without it before I really detect the need. An interesting experience earlier this year: I was hospitalized for multiple bilateral pulmonary embolisms following an injury with some pleurisy thrown in. I was unable to do much of anything for myself for the first couple of days and was sweating profusely, especially at night. I went for at 2 1/2 to 3 days before washing and applying this deodorant. I did not stink. Any of the commercial stuff comes nowhere close to that in my experience. Does it HAVE to be extra virgin coconut oil? I bought regular coconut oil a couple weeks ago because I knew I was going to want to start making some of my own products. I bought just regular coconut oil though. I know that this means it’s processed, but does it have any real effect on how the recipe works? I don’t want to waste the coconut oil, but I also would really hate to waste the other ingredients if I make a batch and it doesn’t come out right. If you can’t tell I’m new to this. I was thinking ,what’s wrong with the common Tai Crystal solid or pump? I also would love to hear an answer to this question. I have been using Solid Crystals for over a year with no problems and it works. But I have heard that this is not good, but can’t find where I saw it and what is wrong with it. Crystal deodorant mineral salts is potassium alum. Google this you will see it is aluminium. You know, that damaging stuff we are trying to avoid by making our own deo? I made this recipe and it’s caused irritation. I guess I’ll have to cut out the baking soda. I wonder if it will be as effective? Can I substitute more baking soda or arrowroot for the clay? I don’t have any clay and don’t want to buy any for such a small amount needed. Thanks! Many people find the baking soda irritating. I think the clay decreases the amount of soda you are actually applying as a filler. You could try adding more starch or even increasing the starch:soda ratio to make it even milder. I found baking soda to be a very competent anti-antiperspirant and deodorant but it totally flamed my pits so I stopped using it. I read once that powder sugar is a secret antiperspirant ingredient for homemade deodorant… Anyone try that… I don’t have sugar in my house so I haven’t. My husband and I use a spray bottle filled with rubbing alcohol (91%, not 70%) and have been happy with that for years! Talk about the lazy way…lol! I made this recipe with a few tweaks to it. It lasts about 2 days for my husband and my son. I added 2 1/4 tsps of charcoal and a few sprays of an oral silver solution.I got 4 tubes full out of this and they are stable at room temp. I also did not do it till almost completely melted. I melted everything together and mixed it up. It seemed stupid to me that you would only partially melt this. Melt it fully for a more shelf stable product in the end. I also didn’t use the lemongrass oil I used a sleepy time oil blend. I found the smell didn’t last as the absorbent qualities of the ingredients made it disappear. I should mention I live in Southern California. Been sitting proudly in my bathroom for a few weeks now. I forgot to mention I made mine in a Wilton chocolate melter. Get them and Joann or Michaels. There is a 60% off coupon this week for Joann. Best thing I’ve bought. it has a warms and melt setting. I have never burned a thing in it. I have one for my herbal mixes and such and one for actual food. I have used this recipe but the baking soda really irritates me. What can I substitute for the baking soda? This is a surprise to us — we’ve never heard that Bentonite Clay is toxic. Including a Mineral Analysis PDF (scroll to bottom). Perhaps this will help sorting through the information? Hi! I tried to make this deodorant recipe but my clay didn’t melt or blend into the ingredients. I bought bentonite. I have a question about the clay. I have some French Green Clay Power. I couldn’t tell what type of clay the Redmond’s brand is. Can I substitute the clay that I have in this recipe? Thank you for this! I can’t wait to make up a batch. That would be fine. 🙂 Clays are usually interchangeable. Thank you so much , will be making this week. I cannot wait to try this! I’m pretty sure the baking soda in my recipe is irritating me. Hi! Have you found that it’s much cheaper than buying natural deodorant? Yes! We do not have an exact figure but we figure it is well below an $8 per tube plus shipping natural deodorant. Hi, I worked and worked on my deodorant recipe, and even a small amount of baking soda would leave burns on my skin. Then I read somewhere that you could had a tablespoon of vinegar to the mix and it would neutralize the baking soda. I wondered if that would stop it from being effective, but it didn’t. I’d saved all my old batches of deodorant and am now adding the vinegar and using it. Works great for me! I’ve been making my own deodorant, but it consists only of baking powder, cornstarch and coconut oil with essential oils. I’d like to try this recipe but wonder about the clay. Does it stain your clothes? I bought a natural deodorant once that had clay on it, and it left green underarm stains on my clothes. 🙁 Thanks for your reply! It is staining on light-colored clothes. My store bought (natural) deodorant with baking soda has become irritating to me. I get bright red blotches under my arms that get extremely sensitive and painful even. Just recently, as a means to reduce the redness and still keep the B.O. at bay, I used coconut oil with tea tree EO (very high quality). The combo has worked well for me and very little was needed. I am prone to B.O. and moisture, and did not find an issue with either. Of course, I’m not an athlete and not sure how a heavy work out would fare. Suggestion to let the oil soak in a bit before putting on nice clothes. I have been making my own deodorant as well, same recipe but use cornstarch ( due to cost of arrowroot) and I dont use beeswax. I love it. Store bought deodorant has started making me itch a couple years ago and after trying several, I came across homemade deodorant and started looking for a simpler and cheaper recipe. This one is absolutely perfect. I will never go back. I had dark spots under my arm and the deodorant cleared it up. No more dark spots and breakouts and itching woohoo.